« Lisa Carlisle: When Darkness Whispers – a paranormal military romance full of mystery and suspense! UPDATE: The winners are…Snarky Mom Michelle and Colleen C.! These three words are on the banner of my author homepage and are a good description of my writing. I’m a romantic suspense author who loves adventures, both in my fiction and in my travel life. Maybe the fact that I lived close to the Bella Durmiente for five years influenced the romance side of my writing. After all, Sleeping Beauty is a romantic tale, even if the heroine didn’t participate in saving herself. Tingo certainly influenced the adventure in my writing. The area around there, with it’s sometimes dangerous jungle habitat and its history of terrorist activity, provided part of the setting for my latest release, TO THE LIMIT, book three of the Shadow Heroes series. I also added some details about driving over the Andes—the altitude, soroche (altitude sickness), and the desolate terrain. In this mixed setting, I placed Mary Beth Williams, in effect a “fish out of water,” and Nicholas Romero, an ex-soldier turned diplomat. Theirs is a romantic suspense adventure that challenges not only their lives but also their hearts. Since scandal rocked her life, Mary Beth Williams has only trusted one person: her brother. Now he’s been kidnapped by narcoterrorists in a remote part of San Mateo. With only ten days to ransom him, she seeks out ex-soldier turned diplomat/negotiator, Nicholas Romero, the only man who can help. The last thing Nick needs is a distraction from settling a score with the powerful general responsible for killing his cousin. But when he learns that Mary Beth might provide him a way to achieve his goal, he agrees to help. It isn’t until they’re deep in the San Matean jungle, pursued by the general’s forces, that Nick realizes what a mistake he’s made. Because the beautiful American tempts him with passion and a future he cannot claim. Fighting distrust and desire, Nick and Mary Beth work to uncover a dangerous truth. But Nick didn’t count on exposing his own secret…one that could cost both their hearts and their lives. Limited time only: To the Limit is available at the reduced price of $0.99. 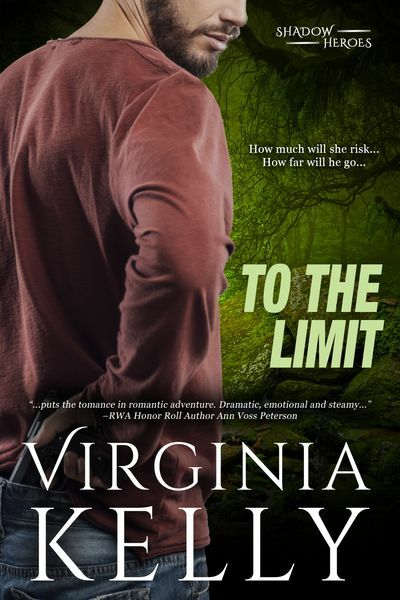 Virginia Kelly is an award nominated author who loves to travel. She lives in Florida with her family. This entry was posted on Monday, May 22nd, 2017 at 6:33 am in Contests!, General. Tagged: Guest Blogger, romantic suspense. You can feed this entry. Both comments and pings are currently closed. So far, the most adventurous thing I’ve done is have twin boys! It’s been a complete adventure, especially now we’re in the teen years and trying to get drivers’ licenses… and facing senior year next year! I’m not too adventurous. Moving 1200 miles from the city I was born and lived in for 57 years was certainly an adventure! Thanks, Delilah, for allowing me to visit for the day. Hope everyone’s having a great day. I have no idea why the Barnes & Noble link is crossed out, because it works. 😐 This Wednesday, May 24, I’ll number the responses, place the numbers in a hat, and draw two names for Dancing in the Dark. Snarky Mom Michelle, my “mom” hat, hard-earned with three children, is off to you. 🙂 I simply can’t imagine doing everything by twos–at the same time. An amazing adventure in parenting. And teens–what can I say? Barb Ellen VanderWel, that’s a LONG trip. I can’t imagine. You saw so much of the country. Someday I’m going to make it to Michigan. Florida is home and I’ve visited Texas a couple of times. Thanks for commenting! Eve Paludan, congratulations on that move! Editing scholarly work to writing fiction, Wow! ButtonsMom2003, one of the biggest adventures has to be moving from the comfort of home. That takes courage. Congratulations on the move! I guess it depends on the type of “adventure” you mean. I guess I’d have to say going for a ride in a hot air balloon over the wine country in N California. Absolutely amazing experience! Deborah S, a hot air balloon ride more counts. I bet that was amazing! And looking down on the gorgeous wine country, wow! Thanks all for participating. I loved hearing about your adventures. 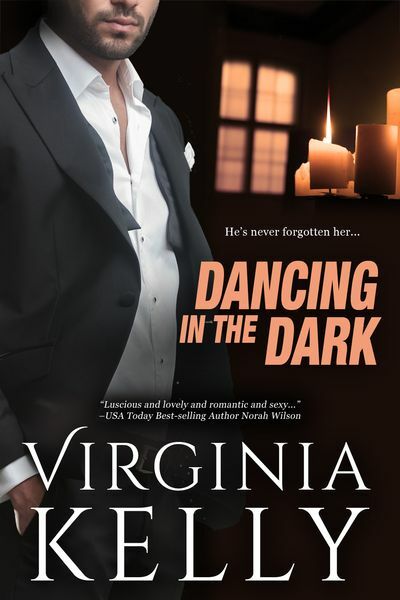 The winners of Dancing in the Dark are: Snarky Mom Michelle and Colleen C. Ladies, please drop me an email at virginia@virginiakelly.net and let me know if you want me to gift you your copy via Amazon Kindle, Nook or iBooks.